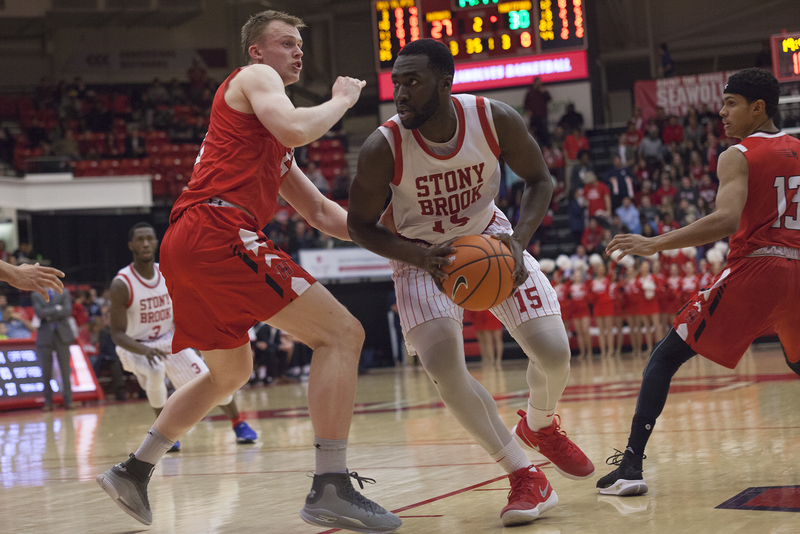 The uniforms were different, but the results were the same for the Stony Brook men’s basketball team on Saturday night against the Hartford Hawks. Struggling to make shots early in both halves, Stony Brook lost its fifth game in a row 73-64 on their home court. The loss came on the night that the team honored the 40th anniversary of its 1977-78 Div. III Final Four team with throwback uniforms. The team even changed their name on the scoreboard to the Patriots, their nickname during that year’s run. The Seawolves faced a 30-27 deficit at the start of the second half. Senior forward Junior Saintel opened the scoring with a dunk, and his team only trailed by one point. However, the Hawks responded with a 13-0 run over a three-minute span to push the lead back to double digits, and they never looked back. Unfortunately for the Seawolves, those open shots didn’t fall in. The team missed its first 10 shots to open the game, while going 2-6 from the free-throw line. Meanwhile, the Hawks found a rhythm driving to the basket and earning layups. The Hawks went up 12-2 by the 14-minute mark and maintained that lead until there was only 3:45 left in the half. Stony Brook had another chance to come from behind late in the second half. Both freshman guard Jordan McKenzie and Yeboah trimmed the Hartford lead to four two different times in the final minutes of regulation. The Hawks had an answer each time, eventually using a 5-0 run to put away Stony Brook with less than one minute remaining. One of the changes Boals made before the game to combat those mistakes was a lineup swap. Freshmen forwards Elijah Olaniyi and Anthony Ochefu along with McKenzie were inserted as starters. Boals said that based on recent practices those players deserved to get a shot, and that the opportunity gave them valuable experience when asked about the change. Despite the sluggish start offensively, Stony Brook made a push late in both halves. Yeboah was a big component of the attempted comeback, as he led the team in scoring with 23 points. Olaniyi was efficient in his starting role, shooting 40 percent from the field and grabbing 10 rebounds. Together the two re-energized the offense, but the team couldn’t make enough stops to close the gap. Stopping them from mounting the comeback was Hartford’s duo of junior guards Jason Dunne and J.R. Lynch. The two combined for 39 points, shooting over 50 percent from the floor. They were particularly lethal from long range, going a combined 6-11 from beyond the arc. The threat they posed on the perimeter eventually opened up holes for the other Hawks to drive and force layups, stifling any Stony Brook momentum in the second half. Stony Brook will look to bounce back on Thursday in the last of its four-game homestand, a match against UMass Lowell. The Seawolves will look to avenge the close loss they suffered on UMass Lowell’s court back on Jan. 24, an 82-79 contest.